Teaching and Developing online: Skin Basal Cancer Public service Notice. Skin Basal Cancer Public service Notice. 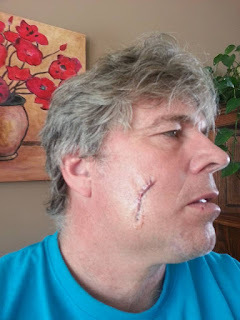 I am overwhelmed with the response I got when I posted my latest acquired scar. I wanted to explain the history of the scar so it might make others look at their skin and their partner’s skin carefully. I first noticed it as a pimple or ingrown hair on my cheek. Such an event in my life normally takes about a week for such an event to heal on my rugged face. This one took longer and because of where it was situated, my CPAP strap was right on top of it and continued to irritated it. I at first thought this was why it was not healing so I put a Band-Aid on it each night trying to protect it. Then I put a napkin between the strap and my face and it still would not close. After changing my breather, so the strap would not be on the sore and it still did not heal. By this time it was a dime shaped red spot with a small square-shaped deep hole in the center. So, I went to the doctor and asked him what he thought. His response was let us try an anti-bacterial cream and see if that will heal it. I came back in a month and it was still open. So, he said he thought it was Basal Skin Cancer and sent me to the specialist. 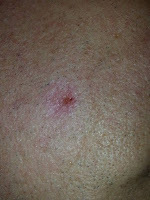 The specialist looked at it and said let us see if we can heal it first and sprayed it three time with freezing spray. If it did not heal in 6 weeks I was to come back. It did not close up and was bleeding on and off…. 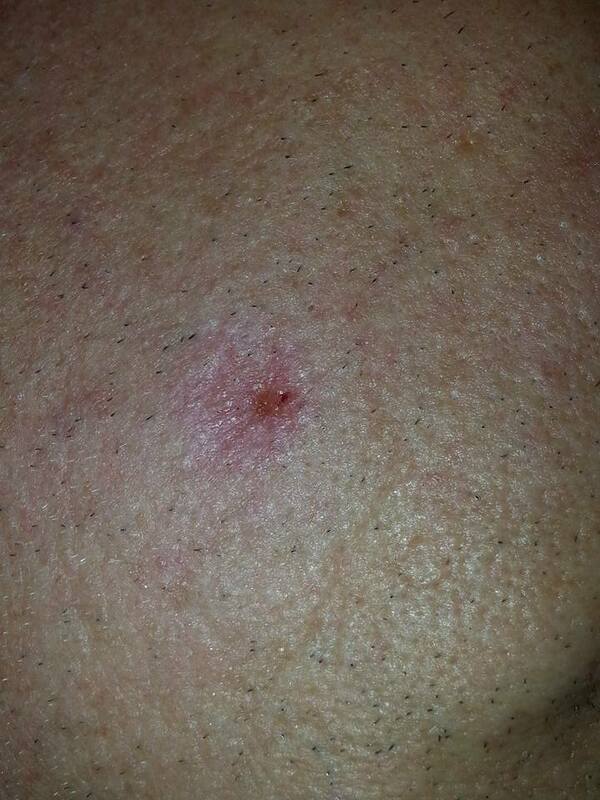 When I came into the office the specialist said it is skin cancer and asked me what I knew about this type of cancer. He put me at ease and removed the alien from my face. Now I wait to hear from the lab if they got it all. If he did not he will cut it open and go back in. It was a dime size red circle, he cut a quarter size with about and a half inch of fat from behind it. He cut it as an elliptical shape so it will create less of a scar. We will see if he got it all and how well it will heal up. 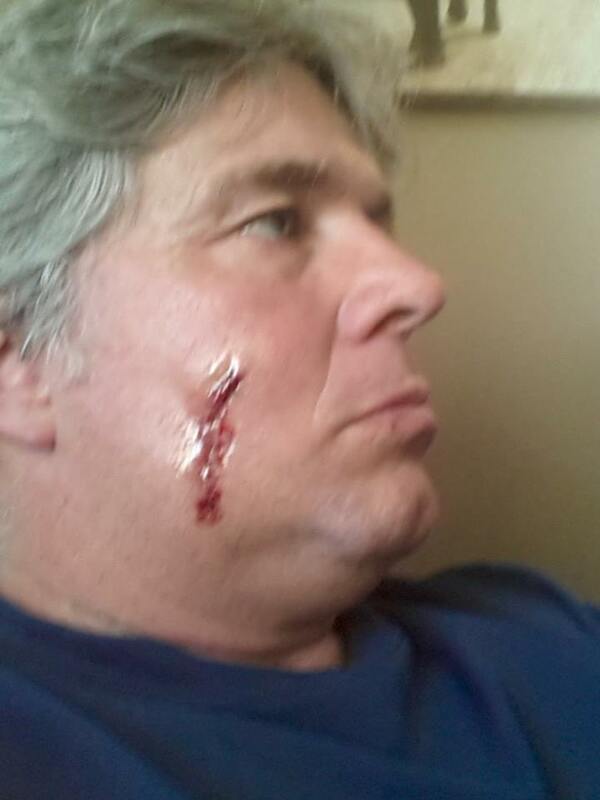 I will continue to post images as it heals up...check your skin and wear sunscreen.